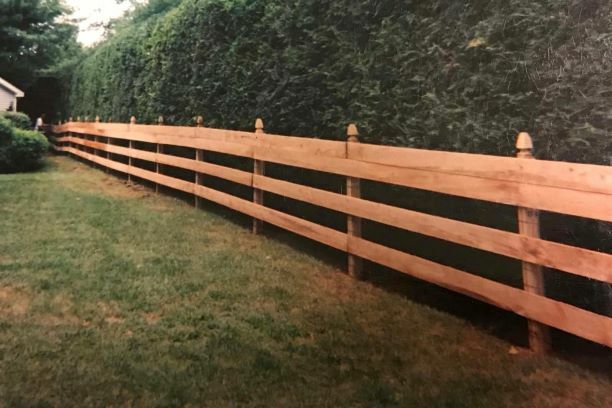 The picture shown is a framed Cedar tongue and groove privacy fence standing 6’h x 8’w and uses 1x6 pickets, 6”x 6” pressure treated posts and 6”x 6” Cedar Hatteras flat caps. The fence sections were installed down hillside in a stepped down manner. The sections of fence were stained by others. Framed tongue and groove sections can be ordered pre-fab and can include a lattice or spindle topper as well. Give your children and pets a safe and secure place to enjoy their home and yard while transforming and framing your landscaping with a wood fence that adds style to your home. A.K.A. The Fence Co. can help you transform the outdoors into an extension of your living space with a traditional preserved wood fence. A wood fence accents the aesthetic beauty of your property and provides the security and peace of mind that makes your home your castle. Transform the outdoors into an extension of your living space with a traditional preserved wood fence from A.K.A. The Fence Co. A quality wood fence installed by us can dramatically increase the aesthetic and property value of your home. Contact A.K.A. The Fence Co. today for a FREE estimate! ** Example: Western Red Cedar has natural oils that preserve the wood for outdoor use, where as Hemlock or Pine does not. Therefore Hemlock needs to be stained or painted to extend the life and the appearance of the product. Please ask your sales rep for life expectancy of either wood. Hemlock 3-Rail Post and Board fence with green weld wire. 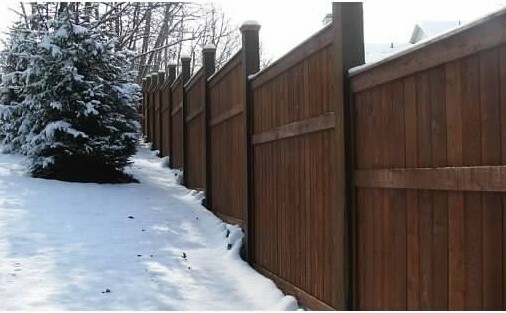 Fence includes a double wide top rail making it 12 inches thick and French Gothic post toppers, screwed onto a regular 4x4 wood post.